July 12 (In port): "About nine o'clock made the land....Took a pilot aboard about two o'clock this P.M., came to an anchor about four near the city. I have been on deck since four o'clock this morning hard at work. I rec'd two letters from home....Tonight--well we are in San Francisco after a long passage of one hundred and sixty-seven days. It is not a very large place. I can describe it better after going ashore." July 18: "Mrs. Harriman sent me aboard the Prima Donna again. When I got back I commenced scouring brass. Rec'd a letter from Mother. This P.M. I saw a fellow that used to work for Uncle Thomas which I have not seen before for six years. I was very glad to see him." 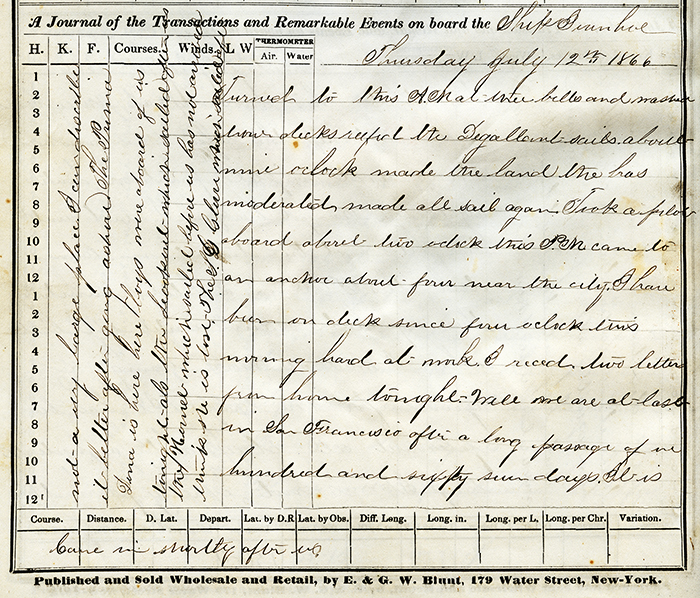 July 28: "Commenced to stand watch tonight for one dollar per night." Aug. 2: "I got Jim to stand my watch, and Bill and I went up to Mr. Whitaker's and spent the evening. I enjoyed myself very much, got back half past ten." Aug. 5: "Ross Whitaker, Ross Lewis, Bill Moody, and Bob Collins were down here and spent the evening, it seems good to get with a crowd of Belfast boys again." Aug. 10: "The crew came aboard today, most of them drunk. All hands have been at work getting the ship ready for sail. We shall probably go to sea tomorrow." Aug. 11: ".....expecting to go to sea but it was so foggy that the tug did not come in the afternoon; she came, but it blew so hard that she did not dare to take us, so they put off until tomorrow morning.....We have got plenty of animals and fowl to look at now: three pigs, two sheep, six roosters, four hens, one duck, and a lady passenger."